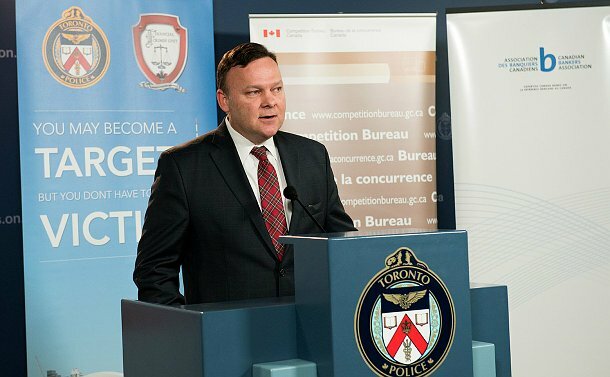 Age, gender or socio-economic status aren’t barriers to fraud, Detective Sergeant Rob Stewart said at the launch of Fraud Prevention Month at Toronto Police headquarters on February 25. Detective Sergeant Rob Stewart speaks about fraud at the launch of Fraud Prevention Month. The Competition Bureau launched Fraud Prevention Month 12 years ago to encourage Canadians to recognize, reject and report fraud. Bank of Canada spokesperson Manuel Parreira reminded consumers that the fight against fraud starts with them. “You, the educated consumer, are the best line of defence,” he said. “Counterfeiting is a crime of opportunity and the success of criminals depend on whether or not retailers and consumers are diligent. The Financial Crimes social media group and the Toronto District School Board have also collaborated to organize a “Don’t be Fooled” event during Fraud Prevention Month in March. It will take place on March 2 at West Hill Collegiate Institute. To reach a broader audience, Financial Crimes investigators use Facebook, Twitter and YouTube to share information and crime-prevention tips.